With only three days left until the celebration, a young boy excitedly prepares for Carnaval in the Andes Mountains of Peru. He anxiously awaits the opportunity to play with the band, which sets the whole Carnaval dancing and singing with its music. Illustrated with photographs of bright and lively arpilleras, cloth art, sewn by members of the artisans’ cooperative Club de Madres Virgen del Carmen of Lima. Growing up, I saw South America on a huge world map that the previous owners of the house we lived in had left covering one wall. I read books that gave me inviting tastes of what that southern continent might be like. Its high mountains, rain forests, and rich variety of cultures were just some of what drew me. It seemed I could find out much less than I wanted from here in North America, and I decided to try to see it up close. In the nineteen seventies I visited there for the first time and spent almost a year, one of the most intriguing years in my life. At one point, I was traveling over the Andes in the back of a truck, bouncing along over dirt roads with potholes big enough to swallow up any cars that dared venture there. As we rounded bends and passed by boulders, children would leap out and throw water balloons or shower us with icy water from buckets-a tradition at Carnaval time. Then, crossing the wide-open altiplano, high plains, would drift sounds of small bands of musicians, sometimes playing in the middle of fields. They were getting ready to march into towns or villages and get everyone swaying, singing and dancing to the music that went on for three days and nights. Dancing or playing music for three days and nights is certainly no easy feat. But people showed amazing strength and enthusiasm, having worked hard physically during much of the rest of the year. 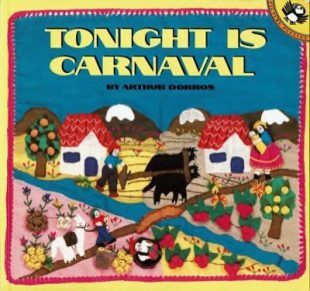 I wanted to write a story about life in the high Andes Mountains, and about Carnaval. The illustrations were done by a group of wonderful artisans who worked together to create the arpilleras, cloth artworks, that were photographed for the book. The people in the cooperative, and others who helped with the project, were incredible to work with. Their generosity and warmth were extended to many, as the cooperative, using some of the proceeds from sales of their arpilleras, ran a kitchen that fed up to three hundred people a day. Despite the many hardships of the artisans’ lives, their artwork is infused with cheer and optimism that I hope you might experience as well. Royalties from the sale of this book are donated to Oxfam America to benefit projects in South America.